Think Print & Graphics Ltd | Think Print Calgary | ThinkPrint | Calgary Printer | Printing Calgary | Calgary Cheques | - Print and Cheques Now Inc. Huge Savings on Business Cheques and Personal Cheques and other printing needs. Welcome Think Print & Graphics Ltd Customers! 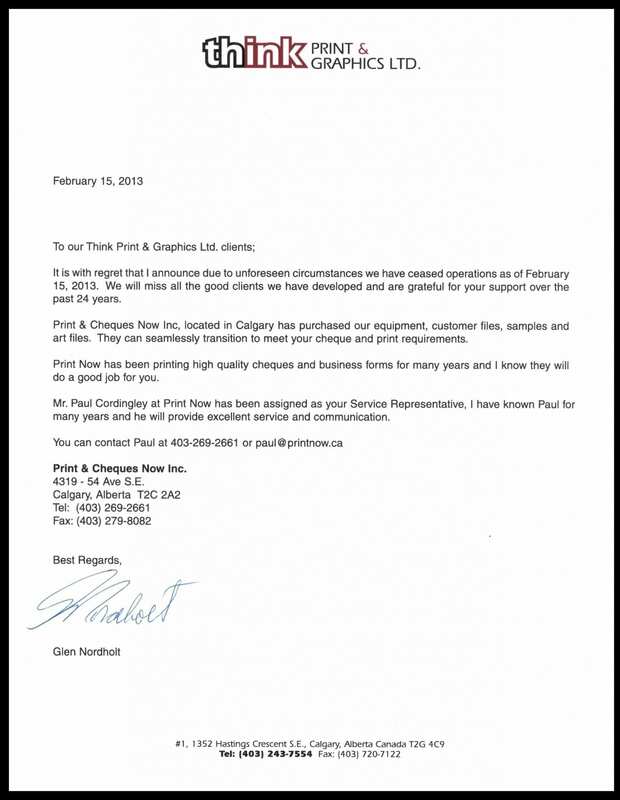 As of February 15th, 2013 Think Print & Graphics Ltd ceased operations. The Good News is Print & Cheques Now Inc in Calgary purchased their phone & fax numbers, equipment, customer files, samples and art files. A little about us: Print and Cheques Now Inc is a Calgary based family business located in the foothills industrial area. We are capable of filling all of your past orders from Think Print, whether it was cheques, stationary items or business forms. We have all of your past Think Print order files including samples of past jobs, as well as all of the Think Print art files for custom jobs. We are a cheque specialist and offer high security cheque stock comparable to the Banks cheque supplier. Please see the attached letter from Glen Nordholt – Owner of Think Print & Graphics Ltd.